While boarding a recent flight, I stepped away from my aisle seat so a woman could take the window seat. She had a couple of carry-on bags and seemed a bit discombobulated so I made a move to help her put her roller bag into the overhead compartment. She said “Oh no, I can’t have you do that, the bag is full of library books!” At first I thought she was worried I might somehow damage them, like she was worried about an expensive vase or something. Then I realized she didn’t want to put me out because the bag would be heavy from all the books. I looked at her and said “Are you kidding, I’ve got five books in my bag, it’s no problem.” To which she immediately said “Which ones?” So we moved out of the aisle and I emptied the contents of my bag for her inspection. 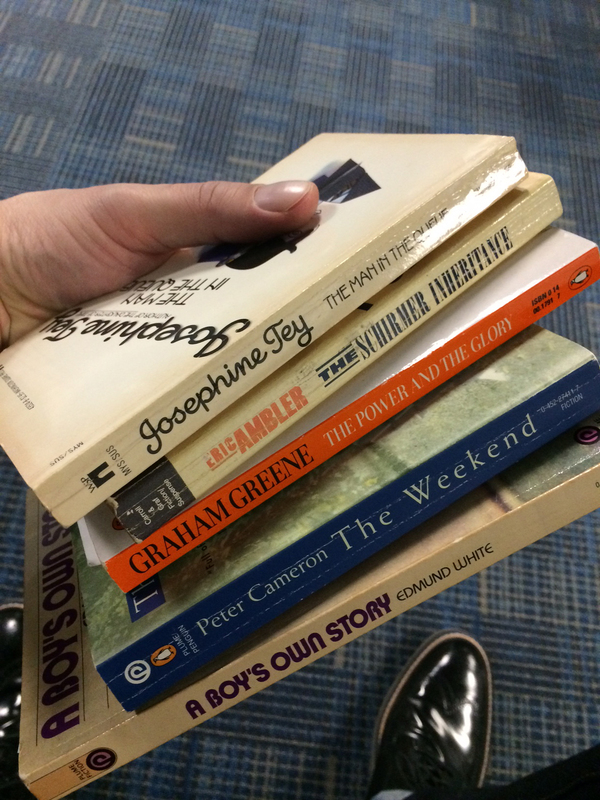 My five books for an eight-day trip. She turned out to be reading Look Who’s Back by Timur Vermes. I just read the NYT review of the book and while I find the idea interesting and the book appears to be well executed, I don’t think I can enjoy a novel that is essentially one book-length gag. She had a second, much smaller carry-on bag that she was trying to put in a spot I knew the flight attendant would not approve of. When I gently suggested that she would need to put that in the overhead bin as well she was a bit flummoxed. It was clear she had thought very carefully about what to pack in the bag she thought would be at her feet. She grabbed her book of course, then was having trouble deciding which of her two knitting projects she would take out of the bag. She decided on the smaller one, but even then began debating whether to keep that one with her or keep it in the bag that would go overhead. Being patient and gentle in a way that I am not normally inclined to be, I encouraged her to keep the small knitting project with her. What if we get delayed on the runway I asked her. When she was ready to put the second bag overhead she insisted that I shouldn’t be troubled in doing it for her. Nonsense, I told her, it’s no problem at all. When she protested further, I told her “The very fact that you don’t expect me to help makes me want to help. If you were one of those people who expects everyone to help out, that would be a different story.” No doubt I felt her a book-reading, organized, kindred spirit, but truly the fact that she had no expectation of help is what made me want to help her. Too many travelers act like their problems should be everyone else’s problems as well. I had only had four hours of sleep the night before so I was a little sleepy and wasn’t sure I was going to get get any reading done despite all the reading material I had. But after a little snooze I perked up enough to get down to three hours of reading. Sometimes I think I am crazy for taking five books for a week long trip. Especially since this trip wasn’t really a vacation. Not only would I be busy with family things, but I would be teleworking during the weekdays. Why did I need five books? Because when I am on a plane I need variety. Two of the five books were already underway when I got on the plane and I was almost done with an audio book as well, but none of those appealed to me at that moment. For some reason Cameron’s book did, and was engaging enough to keep me busy over the course of my two flights. The knitting woman was also on my second flight and I had a notion of finishing it so that I could give the book to her. On the earlier flight she had read the back blurb and pronounced herself interested in it. And, although I enjoyed the book, I knew that I had a second copy at home–the result of too many book buying binges where I don’t remember that I already own something. At any rate I was still about 30 pages short of finishing and I didn’t want to rush the experience too much so I was unable to pass this copy along. At some point in this post I will get around to talking about The Weekend, I promise, but first a little more in the way of reading habits. Although I obviously find the time to read a fair amount, it is not often that I get the feeling of curling up with a book. That sense of deliberately sitting down, getting comfortable and just reading. I guess this stems a bit from the fact that most of my reading time seems to be before bed or with some looming appointment or some chore, or Lucy to walk, or something that is niggling in the back of my brain while I read. While staying with my parents I had one of those golden moments to get comfy on the couch with absolutely nothing on my mind other than finishing the final 30 pages of The Weekend. You all know the feeling I am talking about. I see many of you Tweeting about embarking on that most perfect combination of comfort, time, and no responsibilities, to just sit and read. It has been a long time since I had that feeling, and it was wonderful. Now, on to the book. I became a fan of Peter Cameron after reading his novel Andorra. Without investigating anything about him or his other books, I put him on my ‘must buy’ list for book buying excursions. 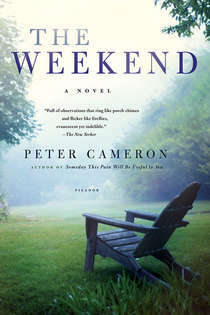 What I didn’t realize until I read The Weekend and then finally investigated his Wikipedia page is that Cameron is gay and/or has written gay themed novels. Published in 1994, The Weekend, definitely feels like a gay novel written in 1994. That isn’t a disparaging remark, I quite liked the book and felt like it was well written. It captures a certain something that feels so completely gay and 1994. Of course HIV/AIDS is background, perhaps even middle- or foreground depending on how you look at it. There is a strong gay man/straight female friendship. It’s New York-based. Concepts of relationships and the value of monogamy are up for discussion. The protagonist’s immediate circle is open and accepting of the his sexuality and there is a general feeling of gay liberation that was fairly new at the time. It was a real time capsule of a book. In some ways I feel like The Weekend was a little half-baked–but only a little. It had all the makings of good novel but I think some of the characters needed a little more fleshing out and I’m not sure Cameron entirely sold me on the the motivations of some characters and their resulting actions. I also feel like Cameron didn’t mean for the two main characters, Lyle and Marian, to be unlikable, but they are. I could be wrong on that point, and I think some of my perception has to do with the period in which the book was written. I imagined reading this back in 1995 and how I probably would have liked Lyle and Marian much more than I do in 2016. Previous Article So how is my book buying ban going? Next Article What have I been reading lately? My problem is I never know what kind of mood I am going to be in and I don’t want to be left with nothing to read. a matched set of bks…we’re so lucky. I am so glad you liked Chamber Music. All Passion Spent was actually the first Virago book I ever read. I was living in London in 1992 and was riding the Northern Line through the same stations as the protagonist in the book as I read that passage. that’s my idea of a good travelling companion, someone you can have a good natter with about books.. But I’m perplexed by the knitting thing, how is it safe to have needles on a flight but not a nail file….. I feel qualified to answer your knitting query, as a frequent traveler and knitter. Honestly, I don’t think it’s an issue any more (nor a nail file); also, lots of knitting needles are made of plastic or bamboo, no more dangerous than a pencil (and the metal ones are fairly dull, less than a ball-point pen. I’ve traveled many times with my knitting needles and have never once been questioned about them. was your experience while travelling on domestic flights within the USA Karen or also on international flights? Now that you mention it, I’m pretty sure I haven’t brought any knitting on an international flight for a long time. If you check the TSA website there are guidelines, though. I think you would really enjoy Cameron’s ‘Coral Glynn’. He’s a fan of Barbara Pym and Elizabeth Taylor and it’s evident in the writing, Cuddles to Lucy! I did indeed like Coral Glynn quite a bit. I picked it up purely on the strength of my enjoyment of Andorra. I know exactly what you mean about feeling more inclined to help someone who doesn’t feel entitled. And I am intrigued by her knitting projects — I just spent three hours on a flight from Houston to Newark knitting a sock whilst enjoying an audiobook. The time really sped by even though I was stuck in a middle seat! It kind of look liked it was going to turn into a sweater. She ended up knitting about 80% of the time and not reading very much. I think she was a nervous flyer. I appreciated your comments on your inability to hunker down and get lost in a book. I have trouble with that, too. I think it’s an effect of age and the way the world has become so intrusive. I think of the hours I spent when I was young, completely lost in a book. Oh, for those carefree days! That was kind of you — as a single middle-aged woman who often travels solo, I never expect ANYONE to help me out and I plan accordingly. On the rare occasion that someone offers I am often so stunned I hardly know what to say, and have to be careful not to be ungracious by refusing the proffered helping hand. That was a good comment about helping people who don’t expect to be helped. I get flustered when travelling sometimes and people tutting and sighing doesn’t help, so I hope I meet fellow travellers like you more than I meet ones that are cross! Love those time-capsule books, too – like ones on Being A Wife and Mother written in the mid-70s, gay books of the early to mid-90s capture an explosion of consciousness, awareness, people stretching out into new spaces, writing their experience. Luckily, Bonnet s thinking about books chimes in with my own often; and so, for example, it was a relief to find that I m not the only one who can read, love and recall the pleasure of a particular book without being able to bring any specifics to mind!